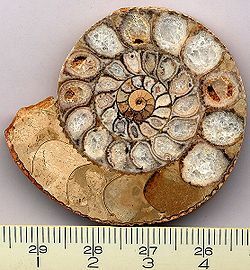 Section of an ammonite fossil showing cameras with different fillings and sedimentary mineral growths. Taphonomy ( Greek: τάφος, taphos meaning "burial" and Greek: νόμος, nomos meaning "law", that is, Greek for "laws of burial" ) is the study of the decaying remains and fossilized remains of dead organisms and how those remains become fossilized. I.A. Efremov defined the term in 1940 as “the study of the transition (in all its details) of animal remains from the biosphere into the lithosphere”. Taphonomy is a significant study within paleontology in which the term was introduced to the field of paleontology in 1940 by Russian scientist Ivan Efremov to describe the study of fossilized remains, parts, and products of fossils and how fossilization develops. The taphonomy performs many roles in paleobiology such as diagnosing the roles of various taphonomic agents, processes and circumstances in the generation of sedimentary and fossil records, the reconstruction of the dynamics of organic recycling over time as a part of Earth's history and evaluation quality of samples relevant to ecological issues. Creationists take a different approach towards the study of Taphonomy by rightly asserting that fossils were formed rapidly during the Great flood by the process of quick burial, and by claiming that fossils were not fossilized according to the uniformitarian principles of constant erosion and deposition. ↑ 1.0 1.1 Lyman, R. Lee (2010). "What Taphonomy Is, What it Isn’t, and Why Taphonomists Should Care about the Difference". Journal of Taphonomy 8 (1): 1-16. ISSN 1696-0815. http://faculty.missouri.edu/~lymanr/pdfs/2010%20what%20taph%20is.pdf. ↑ Behrensmeyer, Anna K.; Kidwell, Susan M.; Gastaldo, Robert A (Autumn, 2000). "Taphonomy and paleobiology". Paleobiology (The Paleontological Society) 26 (4, Supplement): 103-147. http://www.cornellcollege.edu/geology/courses/Greenstein/Paleoecology/readings/behrenetal2000.pdf. This page was last modified on 6 April 2013, at 09:30.